Thursday, November 2, 2017 7:00 PM Jensen Beach High School AWAY 28 Martin County High School HOME 3 Game Recap Joey Alberti’s 36 yard field goal was the lone highlight as the Tigers (4-5) ended their season with a 28-3 defeat to Jensen Beach. Thursday, October 26, 2017 6:00 PM Jensen Beach High School AWAY 19 Martin County High School HOME 14 Game Recap From 10/26: Tyler Chreitzberg connected on two touchdown passes to Jack Potter but the Falcons scored on a late touchdown run and the Tigers lost 19-14 to Jensen Beach. Thursday, October 19, 2017 6:00 PM Vero Beach Senior High School AWAY 22 Martin County High School HOME 0 Game Recap From 10/19: The Junior Varsity Football Team dropped a 22-0 decision to Vero Beach. 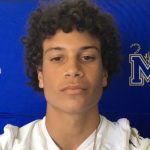 Wednesday, October 18, 2017 6:00 PM Martin County High School AWAY 0 Port St Lucie High School HOME 22 Game Recap The Freshman Football Team (0-2) dropped a 22-0 decision to the Port St. Lucie Junior Varsity Team.